So, here's another one for the Spectrum-oriented readers. Since I haven't done much of Spectrum-originated games lately, I decided to go with one that's a definite classic for the old black beast, even though at the moment, it doesn't even quite fit the Top 100 at World of Spectrum, having a score of 8.26 (just .02 short of a shared 96th spot) from 417 votes. 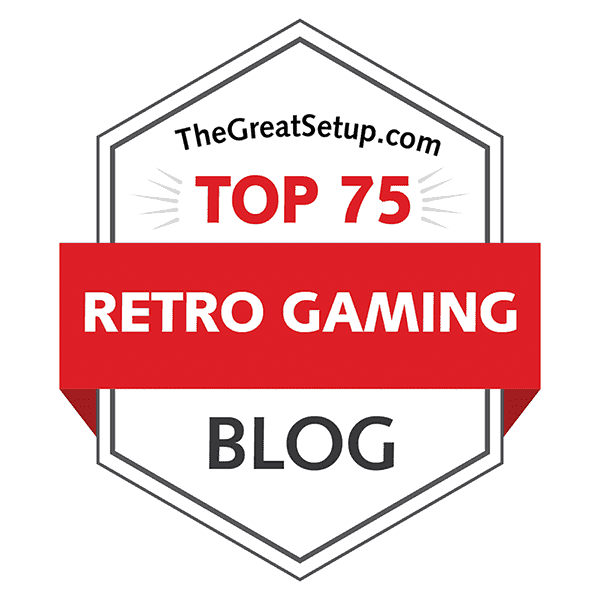 Usually the Speccy's worst competitor, the C64 version has a score of 7.5 from 51 Lemon64 voters. At CPC-Power, the current score is 15.88 from a full 20, while the review at CPC Game Reviews is 8 out of 10. The unofficial Plus/4 conversion has a score of 8.3 from 6 voters at Plus/4 World. And as usual, neither the BBC Micro version nor the TI-99/4A version have any scores to be found, but based on the webmaster's comment on the TI Game Shelf website, it's very impressive. Anyhow, if you have never seen all these five different versions before, you're in for a real shock - hold on to your hats. Sabre Wulf is a flip-screen 2D arcade-action adventure set in a jungle maze of 256 screens. You control the now-famous pith-helmeted adventurer called Sabreman, whose only weapon is a sabre, which cannot even kill every enemy in your way. At least you can consume orchids with sometimes helpful effects, but we shall get further into that later on. Like most games of the time, you are not given much of instructions, so it's a game of trial and error for a good part. The purpose of this, I gather, was to get the gamers more involved with the game by making your own instructions and, naturally, drawing your own map as well, thus giving the game a longer lifespan. Sure enough, it got us involved. Although Sabre Wulf's plot was more or less told in the instructions leaflet in the form of a poem, the goal and the way to get to it revealed itself properly only by making progress in the game. Of course, now we all know that the purpose of the game is to collect four pieces of an amulet to get past the guardian in front of an entrace to a cave in the middle of the maze. Not an easy task. Part of why the Stamper brothers' games were so popular was precisely because their instructions were always vague enough and characteristic. Another part of it was the marketing technique, which would usually only feature a full-page advertisment of their game with just the cover art and some necessary information, but you wouldn't necessarily get even a single screenshot to see what the game was like. Having had early Spectrum hits with Jet Pac, Cookie, Pssst and Atic Atac, gamers already knew that Ultimate Play The Game was a company you could always... well, mostly count on to produce high quality games. In hindsight, Sabre Wulf is definitely a game of its time, and I'm not very sure it would do well on any modern platform, even if it had a complete makeover of graphics, sounds and even the finer points of gameplay. However, being what it was at the time, it also deserves its classic status, and it should be part of any game historian's collection. Haven't done a tape loading times comparison in a while, and since Sabre Wulf offers a great chance to do so - particularly since it was originally released on tape, there was no way out of this. Naturally, the unofficial conversions were never published on cassette tape, so there will be no loading times for those two. If the overall results would be affected in any way by the loading times, the SPECTRUM version would certainly take an easy point here, but happily, FRGCB hasn't done that sort of a thing since maybe December 2013. For further information, if there's anyone out there with a TI-99/4A and you want to play Sabre Wulf on your machine, you're going to need an Extended Basic cartridge and 32K RAM for the disk version, but it's probably easier just to purchase the cartridge. Loading screens. Top row, left to right: ZX Spectrum, Amstrad CPC, Commodore 64. Bottom row: TI-99/4A, Acorn BBC Micro, Commodore Plus/4. 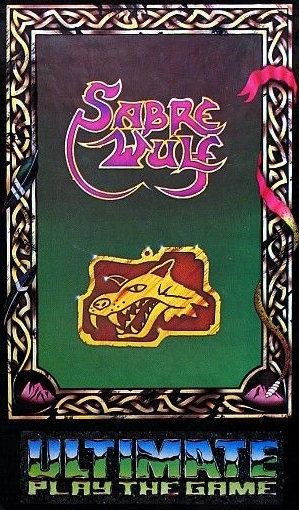 Now, I'm probably going to get a few hatemail for this, but I always thought the original loading screen of Sabre Wulf was designed by someone with no sense of balance. The huge game logo drawn in white inside an oversized magenta background layer modeled after the logo itself feels lazy, and the smiling tiger peeking from behind the Ultimate logo looks like it was suggested by a 5-year old. Only the eyes (or are they moth wings?) and the plants look like they belong on the screen. The SPECTRUM version of the loading screen also followed the fashion from Lunar Jetman and Atic Atac to have the low left corner of the screen use the diagonal straight rainbow to indicate this being a Spectrum release, as if it ever was necessary. There is no denying, though, that whoever drew the loading screen, was good at drawing. The C64 loading screen looks much the same as the SPECTRUM one, but is blockier, and instead of the peeking tiger and the Spectrum rainbow, it features the Firebird logo, as well as an unusual credit placement at the bottom for Greg Duddle. No attempts were made to utilise the C64's multicolour mode to its advantage. As a solid screenshot, the BBC MICRO loading screen looks even more horrible than the C64 screen - after all, the magenta background slab behind the logo is completely deformed, and instead of eyes, the darkness now holds clear characters, such as a wolf, a knight and a... is that a hedgehog? However, the cool thing about the BBC MICRO loading screen is, that there are elements that use attribute flashing (if that's what it's called) to alternate the letter colours in the game logo, the sparkle between the logo and the palm tree, as well as the wolf's visible eye. My favourite loading screen of all four, however, is the AMSTRAD loading screen, which uses the cover art in four colours, hi-res mode, and even uses the wolf amulet graphic not used in all versions of the cover art. And of course, the two unofficial conversions' loading screens are modeled straight after the original loader, with a couple of obvious unique touches. Much of Sabre Wulf's basic idea was already mentioned above. It's a highly involving maze game - or at least it was back then, as you were basically required to draw your own map of the jungle, figure out what each consumable orchid would do, and also figure out which enemies were possible to kill, which ones would only flee from your attacks, and which ones would be unstoppable. Thankfully, you can find all the necessary information from the internet, but then again, that sort of defeats the object. Without proper instructions, you were left to find your own way, which was precisely what these old games were about at best. Just to make things a bit clearer, I should probably talk a little about controlling the Sabreman, if nothing else regarding the game mechanics. First of all, let's go through all the possible controllers for each version. On SPECTRUM, you can play either on keyboard (Q,W,E,R,T) or one of three possible joysticks (Kempston, Cursor and Interface II). You can also pick an alternating two-player mode if you wish. The C64 version also gives you the choice for a two-player mode, as well as keyboard (A,S,;,/,SPC) and joystick controls for either player or both. The AMSTRAD and BBC MICRO versions do not feature a two-player mode, not that it ever was particularly useful to begin with, and the BBC MICRO version doesn't even support a joystick. In the BBC MICRO version, the keys are A, Z, left and right arrows and right Shift - logical enough. The AMSTRAD version uses otherwise the same keys as the SPECTRUM version, but the action button is mapped to Space Bar instead of T. From the two unofficial conversions, the PLUS/4 version takes on after the SPE/C64 versions by featuring a two-player mode, as well as both keyboard (D,C,J,K,SPC) and joystick controls, while the TI-99/4A version only features a single player mode with both control options. The keyboard controls in the TI-version are either cursor keys and Q or... some other ones, which seem to oddly switch every now and then for whatever reason. Probably a buggy emulator or an unfinished version of the game. The most characteristic thing about Sabre Wulf's gameplay mechanics compared to other maze action-adventure games is, that the Sabreman can run wielding his sabre, killing every possible thing within his reach while at it, if you keep the fire button pressed down. By "within his reach", I mean that when he's running up or down a lane, you need to bear in mind, that he can only kill creatures directly to his left or right (depending on your bearing), as well as diagonally up and down the same area. Also characteristic is, that it's easy to get killed in the game, because he can only run facing left or right. Even though the game's controls are simple, Sabreman is not an easy man to handle, at least in the original SPECTRUM version, because his movement features some inertia that keeps him moving a bit after you lose hold of the joystick, and the movement feels overall kind of slippery, which makes going through narrow passages sometimes a bit of a hassle. Another thing you will notice soon enough after starting the game, that Sabreman's movement slows down a notch once he starts swishing his sabre. This is a stroke of genius, because if he were running at the same speed when facing enemies that can't be killed, it would be easier for Sabreman to outrun them, and thus get more easily killed in the situation - after all, he is unprotected from his blind side. The jungle is full of different kinds of creatures and collectibles. I will not go into too much detail, but there are 10 different kinds of monsters you can kill, 5 indestructible ones in addition to a roaming bushfire that appears when you spend too much time in one screen, 7 regular treasure collectibles, an extra life item, and 5 differently coloured orchids that appear on almost any screen at pre-designated spots. The orchids are really the key to success here, but you need to be careful, since two of them will have a negative effect on you, two will give you some sort of a boost, and one will bring you back to your normal self. A word of advice, though: even the orchid giving you the most ill effect is useful when the time is right. (Damn, was that too much already?) As for the different kinds of creatures, all the regular enemies spawn after a second or two from your arriving on the screen in random numbers; the roaming, indestructible enemies roam around randomly instead of spawn on the spot; and the wolf himself needs a brief mention - his behaviour is another stroke of genius, so it's a bit unfortunate that he only appears in one part of the map. Then again, since the game doesn't have a scrolling map, you will die many times due to unforeseen circumstances, such as the wolf appearing on the same spot where you arrive on flipping to the next screen. 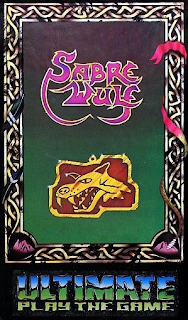 It's just practically impossible not to die once during a playthrough of Sabre Wulf, which makes it a bit too unfair for my taste - there is an element of sheer luck involved in the gameplay. The BBC MICRO version makes things even more difficult by having the Wulf behaviour removed, and the natives often getting stuck at screen exits, both of which I think are just unfixed bugs. Getting back to the basic game mechanics, if you're not a fan of the inertia in the original Sabre Wulf, then you might enjoy the conversions more - apart from the TI-99 version, that is, since it's the only one that follows the original to that extent. Handling the sabre is a bit weird on the TI-99, though: if you choose to draw out the sabre while running, the Sabreman will stop within a few steps. If, however, you draw out the sabre as you start moving, you will move at a slower pace (as it happens in the original), but I have to say this is a strange thing to alter in the game. Most other things altered in the TI-99 version are not that bad - the most notable ones are an exclusive mini-map squeezed into the score panel, the exclusion of a proper high score list, and that the wolf can actually be killed, since he's now of a spawning type. What makes the TI-99 version less enjoyable, though, is a less forgiving collision detection than the original, making you more prone to all sorts of accidents than you normally are. Since we got off to the actual comparison with one of the unofficial conversions, let's continue with the other one. The PLUS/4 conversion is surprisingly good compared to many other unofficial PLUS/4 conversions, but it has the same collision detection problem as the TI-99 conversion - it's too bloody accurate. Apart from having no inertia, the other notable differences to the original are, that the wolf is slower than usual, and there is no speed difference in running with a sabre and no sabre. From the three official conversions, none match the original's quickness. The BBC MICRO version suffers from the same running speed problem as the PLUS/4 conversion, and there also seem to be more indestructible enemies roaming the map. The AMSTRAD version has a tendency to throw 3 enemies on the screen as soon as you enter the screen, but I don't think I've ever seen more than three at once. In comparison, the original and the TI-99 versions feature up to 5 enemies at a time, and the C64, PLUS/4 and BBC MICRO versions 4 at a time. In all these versions, the enemies rarely appear all at once. Apart from that, the only arguable difference to the original in the AMSTRAD version is a relative lack of extra life items scattered around the map. The C64 version features no particularly interesting differences from the original compared to the rest. Although I have to commend both unofficial conversions for exceeding expectations, particularly considering the hardware, I cannot be too enthusiastic about them on the whole, since it's the accuracy of the game we're talking about, and not how limited each machine is. Yes, Sabre Wulf needed to be released as a cartridge on the TI-99, because a disk couldn't fit all the data, but it still doesn't mean the game is perfect. It has too many differences to be considered equal to the original - some are for the better, some for worse. The PLUS/4 version is actually somewhat closer to the original, but somehow, it isn't as fun to play as the TI-99 version, probably due to lack of inertia and speed differences in running. From the official conversions, the C64 version is the closest to the original, while the BBC MICRO version seems to be further away than the PLUS/4 version. As much as I do not completely approve of the loading screen, it is a pivotal part of Sabre Wulf - much like in any Ultimate Play The Game release, at least up to Gunfright (1985), which was the last game the Stamper brothers developed for the ZX Spectrum themselves under the Ultimate flag. Most of the in-game graphics are, Atic Atac excluded, repeated with very slight variation until the end, and most of the available memory is taken by the code and the often unnecessarily large map. At least, they always seemed unnecessarily large to me, but I'm not a big fan of maze games. Title menus. Top row, left to right: ZX Spectrum, TI-99 standard, TI-99 enhanced, Commodore Plus/4. Bottom row: Acorn BBC Micro, Commodore 64, Amstrad CPC. From the title screen onwards until almost the very last screen of the game, the style is made clear: you're stuck in a jungle, where every passage looks much like any other. 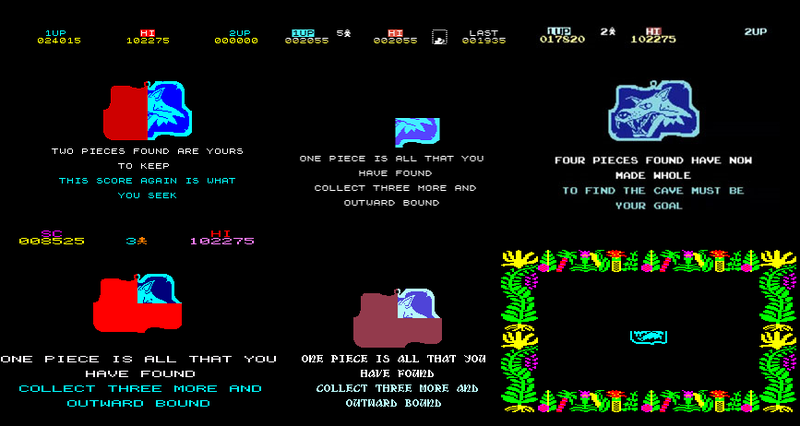 The title screen features main menu text items surrounded by jungle, with a characteristic Stamper-style exclusion of the game title. The only version to feature the title is the TI-99 version, but as it offers no new actual graphics, I shall not comment on it further. The unique enhanced graphics mode on the TI-99 is nothing more than deepening of all the colours, which I don't really think serves the game's character-based graphics very well, as the colour clash inherited from the original is only made more visible. Compared to the original, the most interesting difference on the TI-99 is that all the text has two colours. The COMMODORE PLUS/4 version offers nothing more than a slightly different palette and a new font, but curiously, it omits the score panel from the top of the screen. From the three wider-pixeled editions of Sabre Wulf, the C64 version is the most tolerable. To its advantage, the C64 version doesn't use the machine's default font, and uniquely, you can see Sabreman taking place as the highlighting cursor instead of a flashing bar, or in the case of the AMSTRAD version, two shades of blue. 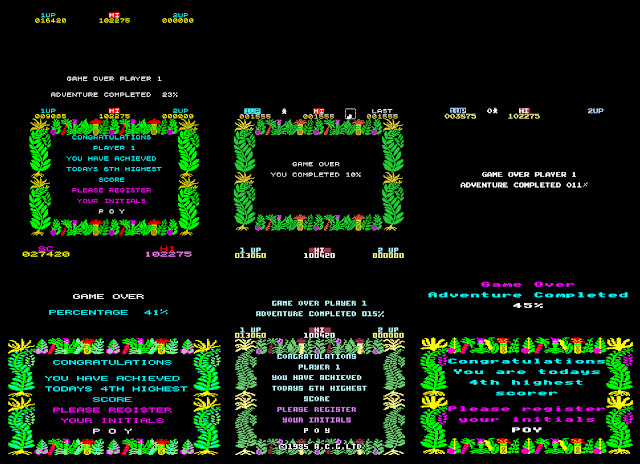 The AMSTRAD version has only barely better detail than the BBC MICRO version, and the score panel placing is more faithful to the original than the BBC MICRO's score and lives display inside the bottom section of the surrounding jungle maze. Just above the starting screen. Top row, left to right: ZX Spectrum, Commodore Plus/4, TI-99/4A. Bottom row: Amstrad CPC, Commodore 64, Acorn BBC Micro. Just above the starting room is graphically one of the most busy screens in the game. You get the basic jungle bits at the bottom, parts of the rocky middle area of the map at the top, and sometimes in some versions, you can see both a hippo and a rhino running the same lane simultaneously. In addition to that, there's a spawn point for an orchid on the screen. All this means that there's plenty of different sorts of colour and detail on this particular screen, that you won't see during about 75% of the map. Sometimes, there will be bordering mountains to see in addition to the jungle, sometimes you can see some ponds within the map to give the jungle more variety. Also from these particular screenshots, you will get an idea of how busy the screens will become at worst, and what sort of action to expect most of the time. The SPECTRUM original, as well as the PLUS/4 and TI-99 conversions look very clear compared to the super-wide-pixeled AMSTRAD and ACORN versions. However, now you can see, that the AMSTRAD version uses multi-coloured sprites all the way through the game, while the C64 and ACORN versions go with mostly monochrome graphics, even though they both use a regular multicolour mode. Not very effective in the C64 version's case, since it could have just as easily used the hi-res monochrome mode. But I have to say, even though both the AMSTRAD and ACORN versions look mostly awkward, it's still nice to see a rendition of Sabreman with some colourful clothes on. Colouring effects from consuming an orchid. Since there's evidence of some important colouring differences in the above picture, I decided to throw in here this comparison of Sabreman's orchid-effected looks. The original SPECTRUM version, and consequently, the COMMODORE 64, PLUS/4 and TI-99 versions as well change the entire monochrome sprite of Sabreman. I found it a very neat little touch in the AMSTRAD and ACORN versions, that the orchids only colour his outfit, rather than the entire sprite. Here's an observation, which might point out there could be a bug in the AMSTRAD version: it seems to be impossible to pick up a yellow orchid. I'm not the only one to observe this, either - check out this longplay video of the AMSTRAD version if you don't care about spoiling yourself the ending (the observation comes near the end of the video). Example of a screen with a native hut. Top row, left to right: ZX Spectrum, Commodore Plus/4, TI-99/4A. While this example of a screen with an inaccessible native straw hut might not be the most interesting scene in the game, it does offer some insight into further differences in details and colours. The wider pixels in all the lower-half screenshots make it impossible to see, whether the hut is made of straws or clay, but at least the yellow roof effects no attribute clash with the red walls. Similarly, in screens featuring ponds, the colour and detail differences are similar. Finding a piece of the amulet. Top row, left to right: ZX Spectrum, TI-99/4A, Commodore Plus/4. For the life of me, I could never find a single piece of the amulet in the PLUS/4 version, no matter where I looked, so I had to resort to copying the only piece of evidence in a picture that there actually are amulet pieces in the game - the Plus4World website's ending archive. So, the picture showing the full amulet in the PLUS/4 version isn't as clear as it normally would be due to the format available there. Anyway, the piece itself, when you happen to find one lying around somewhere within the jungle maze, is an odd-looking flashing piece that only makes sense once you pick it up, and the picture is shown, along with a short poem. I'm not sure whether all versions reveal the amulet in a different order, or whether all the pieces can be found in a different order in all versions, but as you can see, it's a bit different for all versions. The most notable differences in appearance of the amulet screen are in the ACORN version, where the amulet is shown just as small as the piece you find in the middle of the screen - with no poem either, and the TI-99 version, where you don't see red filled frames for the missing parts. Also, the C64 amulet poem has a nice, different font, that fits all the Ultimate adventures rather well. Facing the Wulf. Top row, left to right: ZX Spectrum, Commodore Plus/4, TI-99/4A. I hate to spoil newcomers to this game, but to anyone who has ever played Sabre Wulf for more than 10 minutes, it should come as no surprise that the titular Wulf doesn't appear more than once in the entire game, although it is a bit weird that the game should take half of its name from an indestructible enemy that only appears long before the game's half-way point. Then again, if the game was named by the guardian in the last screen, it wouldn't have been quite as intriguing a title. Although it's clear from the above screenshots, that the original Wulf colouring is cyan, and only the AMSTRAD and ACORN versions follow this rule, it's not the most interesting thing about its appearance. Most notably perhaps from these screenshots, you can see that the Wulf in the TI-99 version is very flickery, and is impossible to get a good screenshot of. Secondly, and more importantly, the ACORN Wulf doesn't do the attack stance and the pounce for whatever reason. Having now mentioned sprite flicker, I should probably point out all the versions' amounts of flickering, since it is an issue related to graphics. The ACORN version is the worst of the lot, by having all the indestructible enemies flicker all the time - even the hippos flicker when sleeping; and on top of that, when two sprites of the same kind walk exactly on top of each other, they negate each other, so at worst, it's impossible to see what killed you. If they're even slightly misaligned, they will just flicker madly. In the AMSTRAD version, the same indestructible enemies flicker, but not nearly as much as in the ACORN version; however, Sabreman is the worst offender in this regard by flickering all the time as he runs around. Otherwise, it's only when things overlap, that any particularly heavy flickering happens, which is expectable. The C64 version also exhibits some notable amount of flickering, which is limited to the bigger indestructible enemies when they're on the move. The SPECTRUM and TI-99 versions are on good standing here, since they have no other flickering apart from when sprites overlap, but the PLUS/4 version beats them all by having no sprite flickering at all. However, it has a more annoying graphical problem: when you die, there's an abrupt screen blackout instead of the proper animation. Game Over + Enter your initials. Top row: ZX Spectrum, TI-99/4A, Commodore Plus/4. There's nothing particular to see about the Game Over screen, but it's interesting to see a completion percentage message used in a game from 1984 already. The TI-99 and PLUS/4 conversions only have a high score indicator, while all the official versions have an additional high score table, and a possibility to enter your three preferred letters on the list. The ending does have something more to see, but it's really the final screen before the ending that is more interesting to see, thus I shall leave all that for you to find out. As Sabre Wulf was made specifically for the ZX SPECTRUM, the game's visuals make good use of the machine's palette. All the reds, greens, yellows and magentas work suitably in the game's somewhat surrealistic jungle setting. The TI-99 and PLUS/4 versions are not far behind, but their use of shadings is not quite as subtle - yes, subtle! - as on the SPECTRUM. The TI-99 version perhaps has some edge over the original due to its lack of sprite flickering, but what it really wins this round by, is the addition of an "enhanced" colours option. It's not necessarily better than the regular option, but it's still more. From the other three, the C64 version is the closest to the original in all ways imaginable, and then the AMSTRAD version takes the higher spot from the lo-res versions. Being a 48k Spectrum game by design, Sabre Wulf doesn't feature much of aural pleasures. There is a theme tune, which is played in the title screen with no exceptions, and it is a portion of Ave Maria by Bach/Gounod. This might seem a bit odd to some, but I actually learned to play the full Ave Maria on piano last year for a Christmas concert tour, and I didn't even realize I had heard it in Sabre Wulf first! Getting back to the matter at hand, every version of Sabre Wulf features Ave Maria in the title screen, only in the AMSTRAD version it doesn't start playing until you've chosen your controls and effectually started the game - and then you need to either wait until the song is over or push the fire button again to really start the game. In all the other versions, you get a short "Get Ready" sort of a tune for marking the start of the game, which consists of 4 different notes, as if it was meant to be played on a set of jungle drums. Other small pieces of music included in the game are a small piece exploring the natural B minor scale (worth of almost 4 bars of 4/4), and an even smaller piece in C major for the Game Over screen. In case you consider a constant loop of running the F major scale from F up to C and back to F as music, then the AMSTRAD version also features that as an extra tune - it's bloody annoying, though, since it's as constant as your running around is. Similarly, the BBC MICRO version features a constant "tick-tock" noise in alternating C sharp and F of your running around, but it's not quite as annoying. Quite interestingly, the TI-99/4A version features the most advanced versions of all the tunes. Ave Maria has the actual Ave Maria melody included, not just the piano arpeggios, and the Get Ready tune has a hectic background arpeggio thing going on. The Game Over tune has a very opposite feel to it with a heavily minor-keyed melody, as is only natural. Unfortunately, one tune is missing, and that is for finding any piece of the amulet. Most of the sound effects are in most cases much as they are in the SPECTRUM original: beeps, splurts and tap-taps all over the place in as many varieties as is necessary. Although the C64 version also follows the original in its single-channel style, it doubles the single channel for everything, and uses some filters to make it feel more advanced. Nothing special, but it's still more interesting to listen to on the long run. The AMSTRAD and BBC MICRO versions sound more like a DOS game, with all the taps and splurts changed to more melodic variants, which takes away a lot of the game's relative calm. Again, the TI-99/4A version is the most impressive around, as it goes with a balanced set of both DOS-like bleepy stuff and Spectrum-like splurts and taps. If Moustgaard still updates his TI-version with the missing tunes, it will easily become the best of the lot. Now, I can only give it a shared best spot. The PLUS/4 version follows the original almost up to the hilt, but has a few false notes here and there, making it instantly sub-par, but it's probably barely noticable for anyone with no musically trained ear. The AMSTRAD and BBC MICRO versions would be much more enjoyable, had they not those annoying walking sounds - the AMSTRAD version being the more annoying one. At the moment, it's rather unexpectedly the C64 version that takes the shared top spot, since it is very unimpressive as a C64 soundtrack. Sabreman eventually returned in Underwurlde (platformer), Knight Lore and Pentagram (both isometric adventures), and was supposed to return one more time in Mire Mare, which still remains unreleased. Strangely enough, Knight Lore has been reported to be the first game in the series to having been developed to finish, but the release of it was spared until after Underwurlde, because they knew it was too good to be published before Sabre Wulf and Underwurlde - it was suspected that releasing Knight Lore before those two would have hurt the sales of the non-3D games. Maybe they were right. Naturally, having made such a huge impact with arguably the first series starring a mascot for any 8-bit home computer, Ultimate's new phase, Rare, has revisited their beloved character a few times in the last 15 years. The first official resurfacing of Sabreman was in 2004, on Nintendo's then-current handheld, Game Boy Advance, with a game confusingly titled "Sabre Wulf". The GBA game is far from the original, being more of a puzzle-platformer than a maze game, and although it's not a bad game as such, it suffers from the modern game disease of cutscenitis. What the GBA Sabre Wulf has in common with the original game is, in addition to the appearance of both Sabreman and the Wulf, the idea of collecting amulet pieces in order to be able to finish the game. Well worth a try, but don't expect the same magic as in the original Spectrum games. Later on, the intended original trilogy of Sabreman's adventures was included in a compilation called Rare Replay, released in 2015 for the Xbox One. While all that is interesting enough, there are those of us who prefer to have an interesting remake at hand in addition to the faithful re-releases. Happily, at least one such can be found for the Windows PC's, which was made by Space-Time Games in 2013. Although it doesn't feature quite every gameplay mechanism from the original, it more than balances the lackings with a scrolling screen and upgraded graphics and sounds. Not perfect, but definitely worth a try. That's it for today - I suppose that's more than enough for one entry. Next time, we have something completely different lined up, so stay tuned! Thanks for reading!